Coleraine made it five wins on the bounce thanks to a brace from Jamie McGonigle at Ballinamallard. The young striker struck either side of the break to put the Bannsiders in control, before Ross Taheny pulled one back for the hosts to set up an exciting finale. 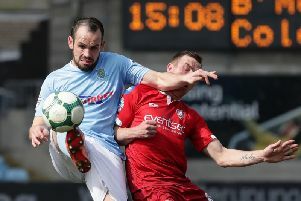 In the end though Oran Kearney’s men held firm to leapfrog Ballymena United in the table. The game started at a good pace. Coleraine looked confident stroking the ball about and this led to an opening for Brad Lyons on three minutes, but he couldn’t keep his shot down. Ciaron Harkin did force Richard Brush into action on 11 minutes, he fumbled the initial effort but gathered at the second attempt. Ballinamallard responded a minute later as Josh McIlwaine got on the end of Jason McCartney’s free kick, but he couldn’t find the target. Lyons was causing the hosts problems with his surging runs, he broke free again on 20 minutes before shooting from an angle, which Brush did well to deflect away with his legs. Brush breathed a sigh of relief following David Ogilby’s free kick on 23 minutes. The big central defender curled a clever effort from over 30 yards, but unfortunately for him it cannoned away off the upright. The Bannsiders edged in from three minutes before the break as Jamie McGonigle cleverly diverted McCauley initial effort past Brush. The striker needed only five minutes of the second half to double his and his team’s advantage. Brad Lyons knocked the ball forward and McGonigle latched on to Ross Taheny’s poor header to poke the ball past Brush. The defender made up for his error on 57 minutes as he headed home McCartney’s corner. Back came the Bannsiders as McGonigle weaved his way into the box only to drag his shot past the far post. Coleraine had their goalkeeper to thank on 70 minutes as the Mallards broke free, there was four bearing down on the visitors’ goal, but Chris Johns beat away Ryan Curran’s powerful shot. The home side ramped up the pressure in the closing stages, but they were unable to really threaten the Bannsiders’ goal. Ballinamallard United: Brush, Morris, Elliott (Owens 56), McLaughlin (Taheny 44), McCabe, McGinty, McCartney, McKenna, McIlwaine, Mayse, Lafferty (Curran 56). Coleraine: Johns, Kane, Mullan, Harkin, Ogilby, McCauley, Kee, McConaghie, Lyons, Parkhill, McGonigle (McCaughan 66). Subs: Twigg, Edgar, Doherty, Whiteside.